Given enough time without water, you die! It’s that simple. In our second post in the series, The Essential Pillars of Preparedness for SmartPreppers, let’s take a look at how not to die from dehydration. I thought I’d be able to cover food as well, but it’ll take up a whole post next time. Getting started on your preparedness journey can be a daunting task. Having potable water is essential for short-term emergencies and long-term survival. At any time you find yourself in a scenario without water for an extended time (three days or so), you’re in a survival situation. Before you go buy cases of bottled water and 55 gallon drums, think about the storage space needed for water. Also keep in mind that water weighs over 8 pounds per gallon. DRG and I don’t personally store tons of potable water. But we do have several methods to produce drinking water in an emergency. We also have access to a nearby natural water source. Our bodies, depending on age, gender, and body type, are made of between 77% to 45% water. We can’t survive without water. When building this Pillar, consider your activity level, availability, nearby natural water sources, filtration equipment, storage capabilities, and climate. Whatever recommendations you’ve read on how much H2O you need, double it. Natural disasters equal lots of manual labor, which increases your bodies need to re-hydrate. If you’ve ever pulled up soaked carpet and pad after a flood, you know the amount of labor and physical exertion involved. The recommended one gallon per day per person does not include water for hygiene, cooking, pets, and livestock. How important are containers? Whole civilizations have been built around these puppies. For thousands of years, lumps of clay on a potter’s wheel turned into bottles, jars, and jugs to store liquids. If you’re not a potter, here are some simple options for water storage containers. Emergency water: Don’t forget that your hot water heater contains 40 gallons (depending on the size) of potable water. In an emergency, simply shut off the power source (gas shut off or electrical breaker labeled in your breaker box, right?). Even if the power is out at your house, it’s wise to take this step if you’re forced to drain your water heater. If the power is restored to your empty water heater, you’ll be replacing the heating elements on a dry water tank. Next, attach a garden hose to the bottom valve. Open the pressure relief valve on the top or side of the water heater and fill those used drink containers you’ve been hoarding. Toilet tank water. A typical tank (NOT the bowl) will hold over 3 gallons of water. To keep from stirring up the sediment in the tank, scoop the water, or disconnect the fill-line from the bottom of the tank and drain into a container. Yes, it’s potable – unless you put bowl cleaning chemical cakes in the tank. [If in doubt, don’t drink from the toilet tank.] Reconnect the fill line so you can still use the toilet to flush waste. With a bucket/container, refill the tank with non-potable water. Now you’ve still got the convenience of flushing with the handle. The ladies will appreciate the extra effort. Water BOB. For $30.00 you can add 100 gallons of potable water to you bath tub. I have no experience with water bobs. Do you? Drain your pipes. In a two-story home, open the tap on the upper floor and collect the water from the pipes at the lowest faucet in your home. On single story homes, find the lowest water spigot (usually an outside garden hose bib) and follow the same advice in the previous line. Kiddy pools and other outside containers can be tapped in an absolute emergency. Be sure to filter, boil and disinfect water from these sources before drinking. Water from natural sources such as lakes, ponds, rivers, and creeks should be filtered, boiled, and treated before drinking. Drinking unsafe water can turn a short-term emergency into a dehydrating, diarrhea disaster – or worse. If you had to get out of dodge on foot, having lightweight water filters would come in handy. Remember, water weighs over 8 pounds per gallon. It would be crazy to try to physically carry enough water in your kit for three days on your back. I’ve got a MSR filter for my 72 hour kit. DRG packs the Sawyer Squeeze Water Filter that weighs only 3 ounces. We both have 2 liter water bladders attached to our bags allowing us to drink while walking or hiking. We both keep a 32 ounce metal water bottle with a metal cup in our kits. Both bottle and cup can be used to boil water if our other filters options fail or are not available. We also carry chemical treatment in our bags – iodine and purification tablets. Don’t forget to add a cotton bandana for pre-filtering debris from open water sources. For the home, it’s wise to have a gravity fed filter like our Royal Berkey. Can’t afford the Royal Berkey? Buy the filters and make your own. Also, Prepper Helper has an article comparing popular water filtration systems if you’re in the market for one. Yes, it takes electricity over at your city water works to treat and pump H2O to your tap. Even if you have well water, power is need to pressurize your water lines. A manual hand pump, solar-powered pump, or gravity fed cistern adds another layer of redundancy to your water preps. Breathing, perspiring, and urinating are a few normal bodily functions that cause fluid loss. You’re losing hydration by just taking the time to read this article. 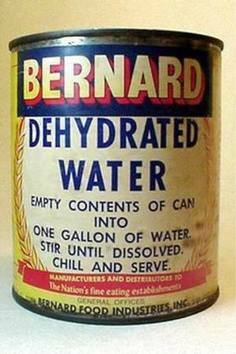 So, drink up SmartPreppers! How are you building this essential Pillar of Preparedness? The comment section is open, as always.